Famous Sri Lanka and Police number eight Hector Gunathilake (the iron man) age 57, died after meeting with a tragic accident in Abha, Saudi Arabia on 7 March. According to authorities, a vehicle that came from behind the cab which Hector was driving crashed and went without stopping. The cab was totally damaged due to the huge impact in the front and rear after hitting a concrete wall. His body was flown to Sri Lanka yesterday. played from 1982-84. He was a member of the President’s Trophy winning CR team in 1983 under Cargo Siriwardena where famous Police players like Hafeez Marso, Mahes Perera, Sunil Sahabandu and Dharmakeerthi played when Police withdrew from the tournament due to the July riots. The team toured Bangkok as a reward for winning. 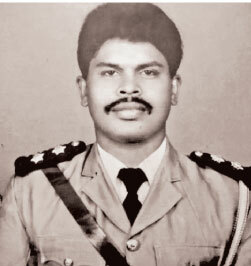 The following year Gunathilake joined Police as a Sub Inspector on 15 June 1984 with Roger Subasinghe and Kapila Peiris. Hector played on and off for the Police till their original number eight Rohan Gunaratne left the force in 1986 and was a regular member occupying the pivotal number eight position from their onwards. Hector’s achievements for Police was phenomenal where he was a member of the winning ‘A ‘ Division inter-club league team for six consecutive years from 1984-89 and in 1991 (six in all). Hector was a member of the Police rugby team which won the Clifford Cup in 1985 and 1991, the Premadasa Trophy in 1986 and 1989 and the inter club 7s in 1985,1988 and 1989. Overall he was a member of 14 major championships for Police from 1984-1992 within a period of 9 years. Hector represented the Sri Lanka rugby team that took part in the Asian Under 25 tournament under Roshan Perera. Hector also went on the tour of Wales in 1987 under Hisham Abdeen. What is more significant is that he has been a member of the Police team that won the triple crown in 1985 and 1989 under Sunil Sahabandu and Hafeez Marso respectively, the best ever milestone achieved in the annals of Police Rugby. “Hector to me is a granite hard player, trier and a great team man with a “never say die” attitude who will never mince his words. He gave his best to all the captains,” said 1989 triple champion winning skipper DIG Hafeez Marso. Hector served at Field Force Headquarters, Grandpass, Manampitiya etc. He then left for Japan in 1993. Hector leaves his 22 year old son, Rositha Kaushalya and his family. His funeral takes place today from his residence 324/16, N.A.S. Silva Mw. Pepiliyana to Kohuwela Cemetery at 5 pm.